Just as various materials can simulate powder tattooing, so can one have simulation of powder soot. While there is usually no problem differentiating an oily material such as grease from soot, problems arise with material such as fingerprint dusting powder, graphite, powdered asphalt and powdered lead. One case that initially caused a problem involved an individual shot in the left chest just above the pocket of his shirt. On examination, there appeared to be a large quantity of soot around the bullet hole. Witnesses at the scene, however, said that the deceased had been shot from several feet away. Subsequently, it was discovered that the deceased habitually carried lead pencils in the pocket with the points directed upward. As he moved about, the graphite wiped off the tips of the pencils onto the shirt. When the bullet was fired through this area, the graphite was interpreted mistakenly as soot. Another case involved an individual shot at multiple times with a highvelocity rifle while lying on an asphalt parking lot. The bullets striking the asphalt reduced some of it to a fine black powder that coated the clothing and body. Other bullets then entered the body in these areas. The powdered asphalt was initially mistaken as powder soot and partially burnt grains of powder associated with the gunshot wounds. In two cases, involving victims shot with 7.62 X 39 caliber rifles, one individual was lying on gravel and the other on concrete. In the first case, the cartridges were loaded with hunting bullets; in the second, with full metal-jacketed bullets having lead cores. In both instances, the bullets impacted the ground immediately adjacent to the victim, breaking up, with bullet fragments penetrating the body. In the first case, powdered lead from the disintegrating core was deposited on the back of a jacket in a linear pattern that paralleled the ground. Associated with this deposit were multiple holes from bullet fragments. 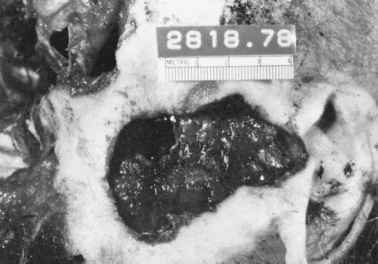 In the second case, the powdered lead was deposited in a U-shaped pattern, with a large irregular entrance wound at the base of the "U" where the bulk of the bullet entered. Multiple small fragment wounds streamed outward along the arms of the "U" (Figure 4.35A). In a study of this phenomena by Garavaglia et al., 7.62 X 39-mm hollowpoint and full metal-jacketed bullets were fired at an angled steel plate. * The cores of the full metal-jacketed bullets were of two styles: all-lead and mild-steel sheathed in lead, with a small conical lead core in front of the steel core. A target draped with white cloth was placed at different distances behind the steel plate. The impacting bullets fragmented, ricocheting off the plate at a shallow angle, in a fan-shaped pattern parallel to the ground. The fragments hit the cloth producing a linear pattern of defects lying in a horizontal plane. * Personal communication with author. 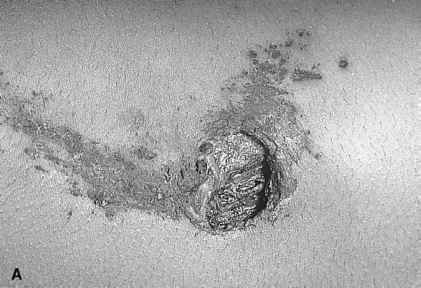 Figure 4.35 (A) "U"-shaped deposit of powdered lead with large entrance at base of "U." (B) Linear deposit of powdered lead and bullet fragments on cloth from 7.62 x 39 bullet that struck steel plate at shallow angle. Overlying these defects was a linear deposit of powdered lead (Figure 4.35B). The closer the cloth was to the point of ricochet the denser (darker) the lead deposit. As the distance increased, the lead deposit grew lighter and disappeared at between 14 and 18 inches. These observations were true for both the hollow point and full metal-jacketed bullets. Subcutaneous hemorrhage at an entrance may have a purple-black appearance and on cursory examination appear to be soot. Closer examination will readily reveal the subcutaneous nature of the deposits. More commonly, mistakes are made when the edges of a gunshot wound have dried out, giving the edges a black appearance. An inexperienced pathologist may interpret this as soot and searing. Use of a dissecting microscope readily differentiates soot from artifact. If there is any doubt as to the nature of the entrance, it should be excised and submitted for SEM-EDX analysis. Soot itself is of course carbon and nonspecific, but primer residues will accompany the soot and can be identified in the sooty deposit.